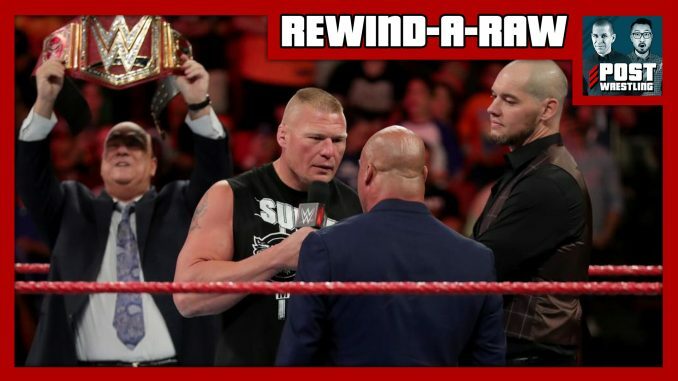 Brock Lesnar returns to Raw for the first time in three months for a show-long angle, culminating with an attack on Kurt Angle and a teased split with Paul Heyman. Plus, Ronda Rousey will wrestle on next week’s show, Bobby Lashley sings, a great match between Seth Rollins and Drew McIntyre & more. We also discuss the deaths of several performers over the weekend with Brian Lawler, Nikolai Volkoff, Brickhouse Brown & Tracy Caddell passing away. Wai reviews the season finale of Total Bellas (Season 3 Episode 10) Nikki Bella and John Cena call it quits, Cena guilt tweets & Daniel Bryan is cleared to return to wrestle. John reviews the post-Slammiversary episode of Impact with the follow up to the PPV, Austin Aries challenges Anthony Carelli, the debut of Scarlett Bordeaux, the end of Madison Rayne, throwback match involving The Young Bucks & more. Wai & John review Being The Elite (Ep. 113) featuring an ALL IN dream match announcement, Nick Jackson turns 29 years old, Taka Michinoku’s “tell all” about the Val Venis angle, Kenny Omega’s secret to going unbeaten in the G1 and The Young Bucks’ new children’s book revealed.